The Review: Alchemists have tried and failed for all of human history to find a way of converting base metals into gold. For all of our understanding of elements and their combinations driven by thousands of years of science, that understanding has not driven a way to be able to produce quality from just anything, and the same can be said for films. Somehow the Die Hard franchise produced what’s seen by many as the gold standard of action movies, a standard that has endured to this day and a series which has produced varying quality but never truly disappointed. Until now. I’m not going to beat about the bush, A Good Day To Die Hard is dreadful on almost every conceivable level; the only mystery is how a formula which seemed to be the alchemist’s dream, almost impossible to get wrong, has been so badly handled by Skip Woods, John Moore and Bruce Willis. Let’s take each of the main culprits in turn. First of all, a hallmark of the Die Hard series has been their ability to handle an action scene, with previous directors John McTiernan, Renny Harlin and even Len Wiseman all knowing where to put the camera, how to frame the shots for maximum impact and how to generate pace and tension. John Moore has none of these skills and the action scenes are bland and repetitious. The crucial failing seems to be confusing John McClane with The Terminator, for while the previous four films all understood how to show a man bravely / stupidly venturing into unlikely situations, and occasionally barrelling head first into stupidity, here McClane rampages around in a manner that would make a T-1000 malfunction. Consequently any possible sense of drama or tension has evaporated before we even reach the halfway mark, and the majority of the running time is a procession of dull, repetitive stunt work – McClane gets attacked by a helicopter shooting at a building not once, but twice. Writer Skip Woods hasn’t exactly given him a lot to work with. This fifth dying of the hard variety is unique in the sense it was written as a Die Hard film, rather than being retooled from an existing script, and on this evidence that was a worse idea than diving off a building tied to a fire hose or driving a car into a helicopter. I could reel off all of the elements that should have made the script and didn’t – and we’re talking fundamentals like a plot, decent bad guys and some form of development for the man always in the wrong place at the wrong time – but it’s just a shame someone didn’t do that for Woods before he fired up his laptop. The Die Hards have always managed to work up a reasonable amount of intrigue and get McClane to do some actual police work, but here he stumbles around blindly in search of narrative and here has less luck finding story here than he normally has finding trouble. The Die Hards have always had a fantastic array of supporting characters, blessed with both quality and depth and helping to underpin the world-weariness and warmth in McClane’s character. Take away that quality and depth and Bruce Willis just appears bored and shouty, and if the bad guys had a nanogram of charisma between them you’d be rooting for them instead. Everyone seems to think that you throw another McClane into the mix and that’s enough, but Jai Courtney and Bruce Willis have zero family chemistry, and by the time of the ill-advised excursion to Chernobyl – where science and logic bid a sad farewell to all participants – the end can’t come quickly enough. Whatever the recipe was here, the previously golden Die Hard series has been turned to something browner and much more leaden. Something in me feels that, if I’d put my mind to it, I could have been much more insulting about AGDTDH, but if no-one involved with the film can be bothered, why should I? Why see it at the cinema: You’d be better off blindfolding yourself, then beating yourself over the head with a piece of wood with a blunt nail in it. 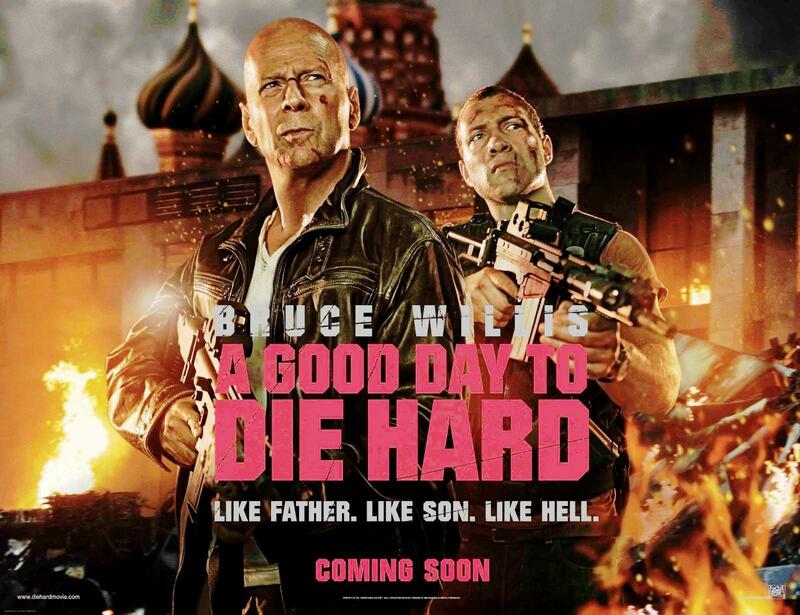 Not only will it be less painful, but the fact that sometimes you’ll hit yourself with the nail and sometimes you won’t adds a variety and sense of danger that A Good Day To Die Hard is sorely lacking. What about the rating? Rated 12A for strong language and moderate action violence. The big controversy here, if you didn’t somehow hear about it being ranted extensively on Twitter and blogs the length and breadth of the country, is that the US got an R-rated version (broadly equivalent to our 15) and we got the neutered, less mother abusing 12A version. Anyone that thinks this was (a) anything other than a desperate ploy to feel a steaming pile of detritus to the masses, and (b) denying us a much higher quality 15-rated film based on extra swearing and blood sprays, is as wrong as everyone involved in the making of this sorry pile. My cinema experience: I sat in a cinema hating myself and everyone involved in this for an hour and a half. (It was the Cineworld in Bury St. Edmunds.) I’d only gone to see it in an effort to truly compare the efforts of the new Arnie, Sly and Bruce movies; Arnie wins this one hands down. Two people claimed to have enjoyed themselves as I heard them talking on the way out; they desperately need higher standards, and it made me pine for the feeling I had about Die Hard 4.0 at the same cinema. At least the cinema suffered no sound or projection issues, but for a first weekend Saturday evening showing it was a desperately thin and uninvolved audience. The Corridor Of Uncertainty: Thankfully the experience was only prefaced by twenty minutes of ads, trailers and the other usual guff, meaning the agony wasn’t prolonged for too long. This entry was posted in Reviews and tagged 2013, A Good Day To Die Hard, Bruce Willis, film, Jai Courtney, John Moore, movies, review, Skip Woods. A poor story, like the characters, but with a good start and entertaining that will be laughable and inconsistent. Still, disappointing. Good review.